In the spirit of networking, I have found a like-minded-fellow-artist-mom at school and we have formed our own 'club'. Realizing that we are both deadline driven, we have decided to meet once a week to check in and help keep one another on task. It's one thing to talk about all the things we want to do and quite another thing to actually carry it out. We hope to assist each other in the 'follow through' by having someone to be accountable to. Though now that I have started this blog, I feel accountable to all who read it! At our first meeting at the aptly named 'First Cup', we secured the December slot to show our artwork in the coffee shop! We happened to ask at just the right moment, (someone had just canceled!). It is normally open to first come first served beginning in June. We felt a bit invincible, as if this is the beginning of a Power-Partnership in which we are capable of accomplishing great things! -Let's hope that's true! I think it's important to keep the momentum going, not to slack off or get too distracted. We have continued to meet once a week and have discussed our direction and goals. Last week we decided to play with block printing and actually get our hands dirty by making some ART while we talk. It was fun relearning an old technique and trying a new one: with Styrofoam trays! It felt good to dive in and just experiment. Making ART has become such a big deal to me that I feel like when I do it, it has to count. I realize that this is precisely what has kept me blocked for so long! I need to let go of the finished 'product' and just play with the process. Ha ha, it just hit me; we chose 'block' printing to get the juices flowing. . . is it a coincidence? There are so many things I would love to explore and paint, how do I pick one and begin? 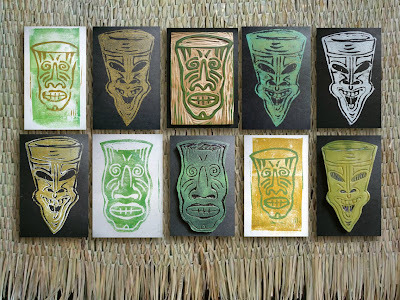 Lately, I just can't stop thinking about Tiki's! Perhaps I should be thinking about something more meaningful and relevant. . .there IS a WAR going on after all! But here in my own little bubble, I am intrigued by the image of a Tiki as a powerful Talisman. A guardian against the evil spirits that may try to defeat me! Plus I think they're really cool! Aia nô i ka nânâ `ana. [ai' (y)ah NOH' ee kah NAH'NAH' ah' nah] We'll see (what the future brings). Revved Up and Rarin' to go!